Here is a new current status report from day 3 of Finnmarksløpet. The charming Ole Henrik Isaksen Eira won the FL-junior race today. He races with dogs from May Conny Johansen. At the age of 14, he is the youngest ever participant in the race and impressed everyone with winning in his rookie year! Solveig Kristine Kvam finished 2nd and Maria Jøraholmen finished 3rd. These three are also awarded the gold, silver and bronze medals respectively in the Norwegian Championship for juniors in long-distance sleddog racing. One this is for sure: Everyone is a winner in the junior class of the race! These youngsters in the age range from 14 to 17 are among the toughest in the country for their age group! It is also worth noting that mushing (sleddog racing) catches the interest of an increasing audience. Participation in the junior race is no longer ‘only’ for children of established mushers, a point proven by the bronze medalist this year. Maria Jøraholmen comes from a family with no background in mushing; she just found out on her own that this is something she wants to do. At the time of writing, Harald Tunheim is in the lead of the FL-500 class. The experienced musher, who has won the FL-1000 five times before – has really impressed us when 301 out of 565 kilometers are covered. He has a full dog team with him to Jergul, where he is resting at the time of writing. Rookie Jimmy Pettersson is following behind TUnheim. He has also impressed us with his high speed on-trail. We have already notified you of fast-running Swedes, so we are not that surprised. The Czech Jiri Vondrak rested a full six hours and 21 minutes at cp Kautokeino. His dogs are used to more intense leg races, and many are curious to see how the Czech and his great team handle less sleep between legs than they are used to in southern European races. And what happens to the Wingrens? Father and son Wingren are following immediately behind the lead pack. Father Ole and son Ronny are relatively evenly positioned at checkpoint Jergul. The queen of FL-500, Elisabeth Edland, arrived as #1 to cp Jergul; however, we need to address the accumulated running time in order to find out who is that fastest musher so far. Everything suggests that this year’s winner of the FL-500 race will not be able to rest more than the mandatory rest hours. Finnmarksløpet observes a lot of new Facebook followers and followers on our home page. There is not much doubt that many of these belong to the Dallas Seavey fan crowd, the musher who is currently in the lead of the FL-1200 race. We are somewhat surprised that the American leads so early on in the race. He has been a favourite all along, though many had predicted that it would take Seavey longer to take the lead in this race. 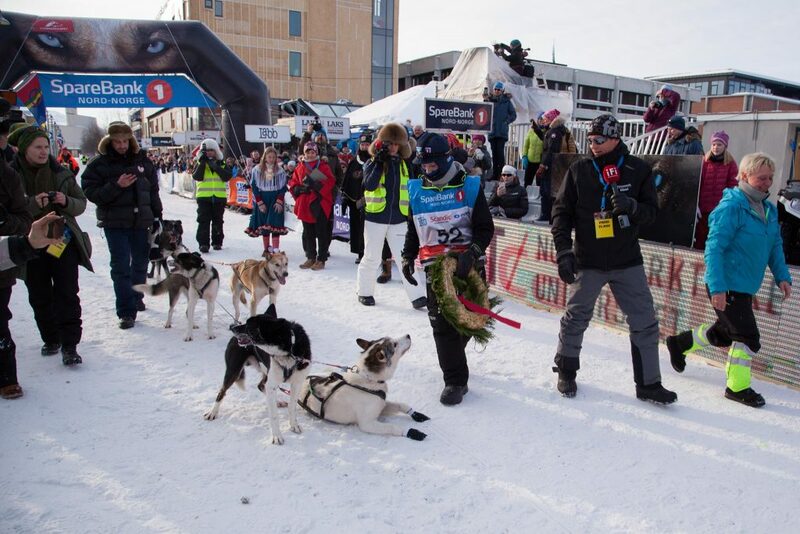 Seavey has had several dogs in his sled for long durations of the race, and there is not much to indicate that he will lose speed anytime soon. Ola Brennodden Sunde was in the lead until checkpoint Levajok, however, he had to scratch from the race due to his own falling ill.
Last year’s winner, Petter Jahnsen (‘Pete’), has also taken ill according to recent reports, though for now he’s still in the race. Wærner arrived exactly 40 minutes behind Seavey at cp Tana late tonight CET.